Centipedes are nicknamed “hundred-leggers”, based on the species they can have between 15 and 177 pairs or legs. Color: Yellowish to dark brown and at times with darker markings or tripes. Habits: House centipedes are most often night time predators of spiders, flies and will at times eat plant materials. Habitat: Centipedes prefer areas of high moisture, such as grass and leaf piles, beneath rotting limbs and logs or even under stones. 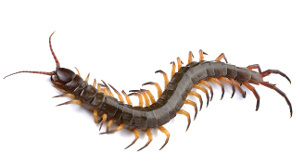 Homes with damp crawlspaces, basements and bathrooms are naturally attractive to centipede invasions. Threats: House centipedes have poisonous jaws that used to inject their prey with venom but do not pose a serious threat to health or property. Large centipedes are capable of inflicting a painful bite, much like a bee sting.